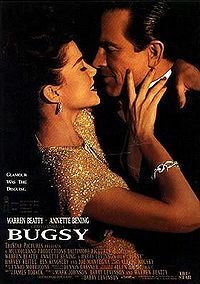 Bugsy (1991) is a fictionalized, romanticized film about the last ten years of the life of Jewish gangster Benjamin “Bugsy” Siegel, played by Warren Beatty. It begins in 1937, when Siegel was sent by the Mob in New York to California to develop gambling rackets on the West Coast. “Bugsy” (known by that name because of his violent temper) became enchanted with the bright lights of Hollywood and with his vision of a luxury gambling casino and hotel in Las Vegas, Nevada. The film traces the story of his growing passion for the hotel (the Flamingo) and his love affair with Virginia Hill, played by Annette Bening. Seigel longed for two things: legitimacy and glamor, and he thought that Las Vegas held the promise of both. As his longing turned to obsession, he made promises he could not keep to his Syndicate bosses and bankrollers. He died in a rain of bullets in his home in Beverly Hills. The film opened to warm reviews and strong box office receipts. It was eventually nominated for 10 Academy Awards, of which it won 2, for art direction and costume design. No doubt about it, Bugsy is a marvelously entertaining film and a treat to watch. The period sets and costumes are beautiful, the script is excellent, the actors are wonderful, and we have the added pleasure of watching Warren Beatty and Annette Bening fall in love on the screen before our eyes. (They married after this film, and remain married to this day.) The trouble is that while it’s a great movie, it’s also wonderful fiction. The real Bugsy Siegel may have been as handsome as Beatty, but in real life he was a much uglier character, a stone-cold murderer who was known and feared for his crazed rages and cruelty. However, the film points to a part of American Jewish history that is often glossed over: there was indeed a Jewish Mafia that operated during the first three quarters of the 20th century in the United States, with roots in the 19th century. Jewish mobsters are often pictured as the “accountants” of the Mob, a stereotype that this film perpetuates with its depiction of Meyer Lansky, played by Ben Kingsley. In fact, as the life of Bugsy Siegel shows, they were violent men engaged in organized crime who often died violent deaths. (Lansky was an exception. He retired to Miami Beach.) Within the Jewish community there is often an urge either to romanticize them (as with this screenplay) or to forget them altogether. The truth is much more complicated, and an interesting contrast to stereotypes of Jews as bookish and weak: these were men who were completely unafraid of a fight, as Rich Cohen points out in his book about them, Tough Jews. One other thing to note about the gangsters: while the American Jewish community doesn’t talk about them much, Anti-Semites are obsessed with the Jewish Mafia. They tell tall tales suggesting that the gangsters were part of an international conspiracy by the Jews. The truth is bad enough, but those men were in no way part of a larger Jewish plan. That is one reason it is worth learning the genuine facts, however unpleasant. See this film for a good time, but don’t take it too seriously. If you are curious about the Jewish gangsters, check out Cohen’s book, or any of the other good books on the subject. This entry was posted in United States and tagged Anti-Semitism, Drama. Bookmark the permalink.